A Delicate Balance Between Warm and Cold? It's Cold in Mexico! 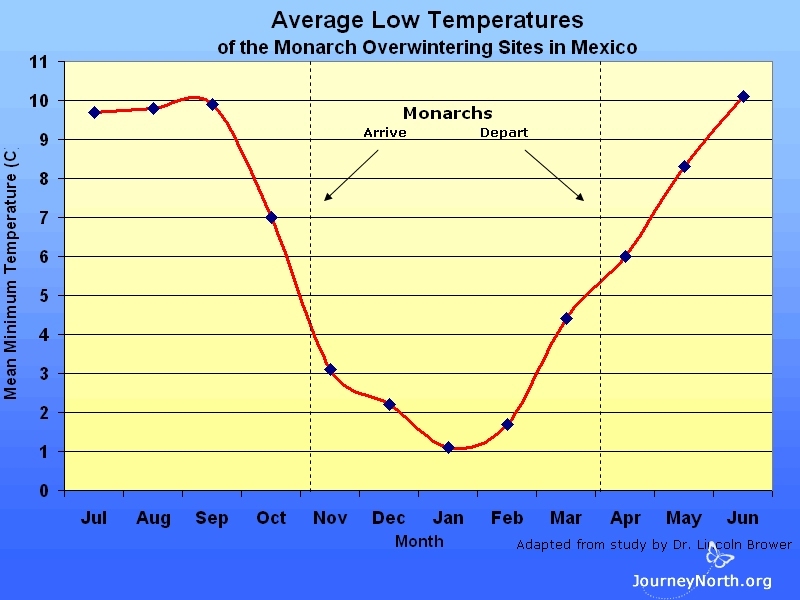 During the day it's usually warm at the monarch's winter home in Mexico, but at night it's as cold as the inside of your refrigerator. Sometimes it's even cold enough to snow. 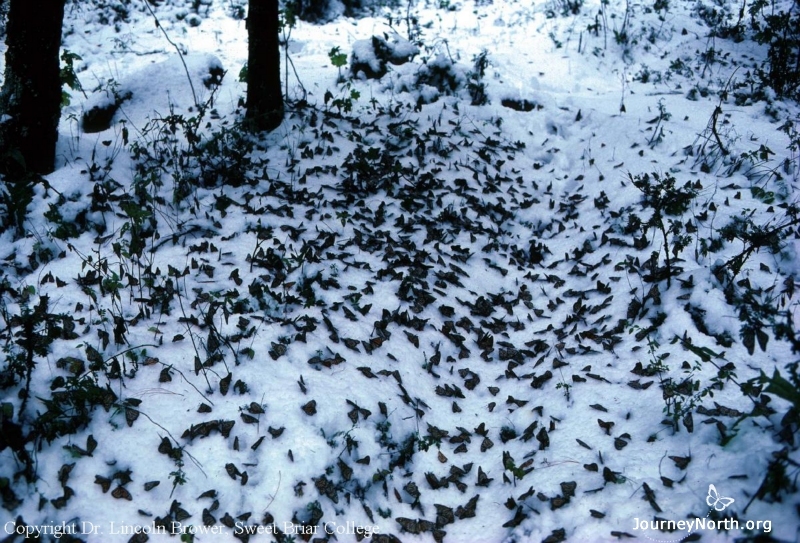 Why do the butterflies migrate across the continent to spend the winter in a place that is cold? Monarchs need cool temperatures to survive. Cool Temperatures Help Monarchs Survive “Since monarchs are cold-blooded, they do not use much energy when they are in a cool environment,” says Dr. Karen Oberhauser. 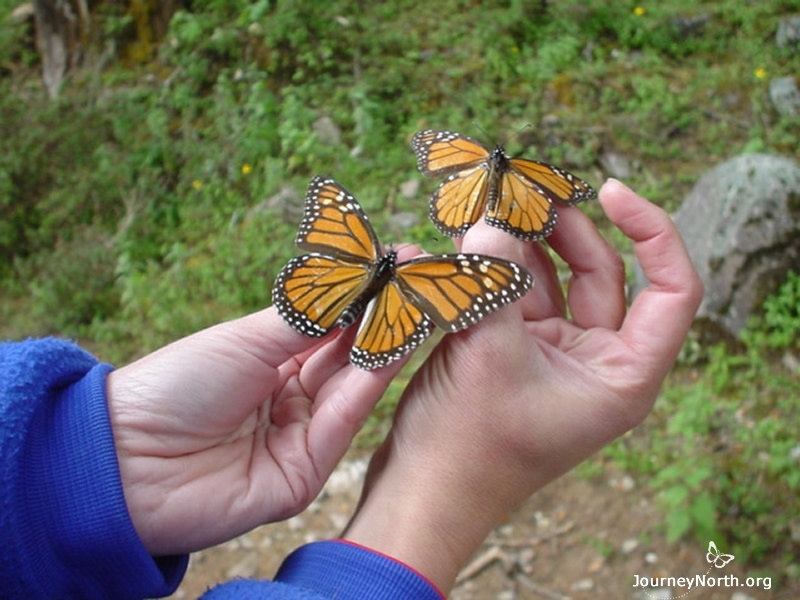 Monarchs arrive in Mexico with fat (lipids) stored in their bodies. They eat very little, if anything, during the winter months. Because of the cool temperatures, they burn their food reserves slowly. 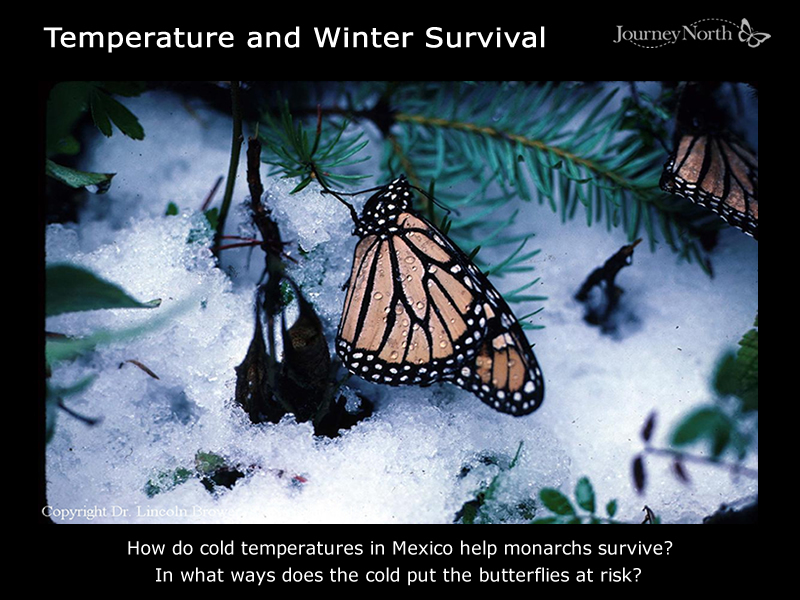 Cold Temperatures Can be Dangerous Monarchs save energy by living in a cool place, but there are also dangers. If temperatures are too cold, they can freeze to death. Wet, cold monarchs are in particular danger. Ice crystals that form on the butterfly can kill it. Cold Temperatures Can Paralyze Monarchs Monarchs can't fly unless they can warm their muscles to 55°F. They can't even crawl below 41°F. The monarch pictured here can only crawl. It took one hour for this butterfly to crawl a few feet. Although monarchs can save energy when they are cold, the cold also makes them vulnerable. When Dangerously Cold? "January and early February is the coldest time of the season. 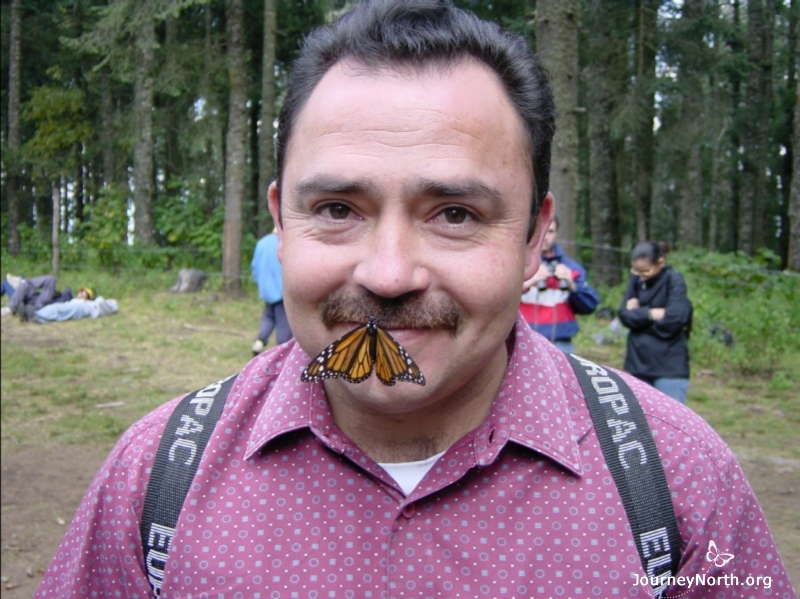 This is a really critical time for the monarchs," says Dr. Lincoln Brower. 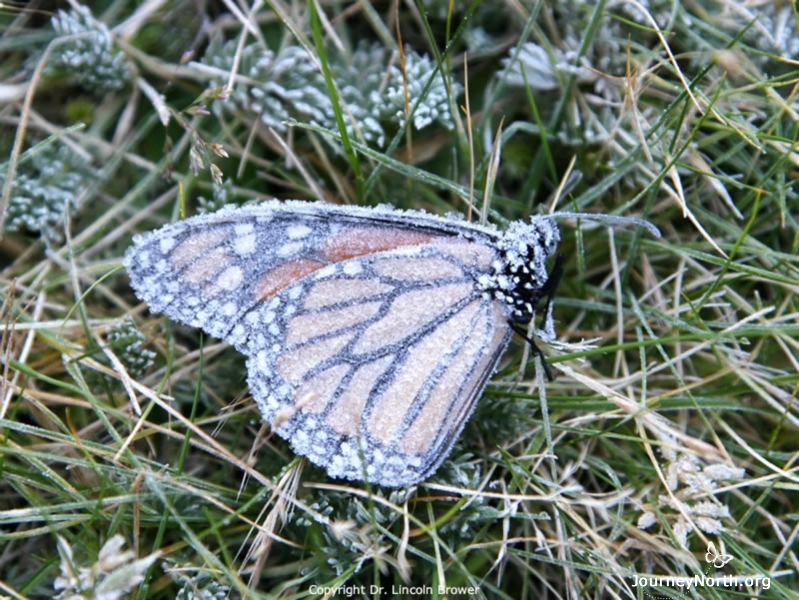 "We know temperatures below -8°C will kill about 50% of the monarchs. 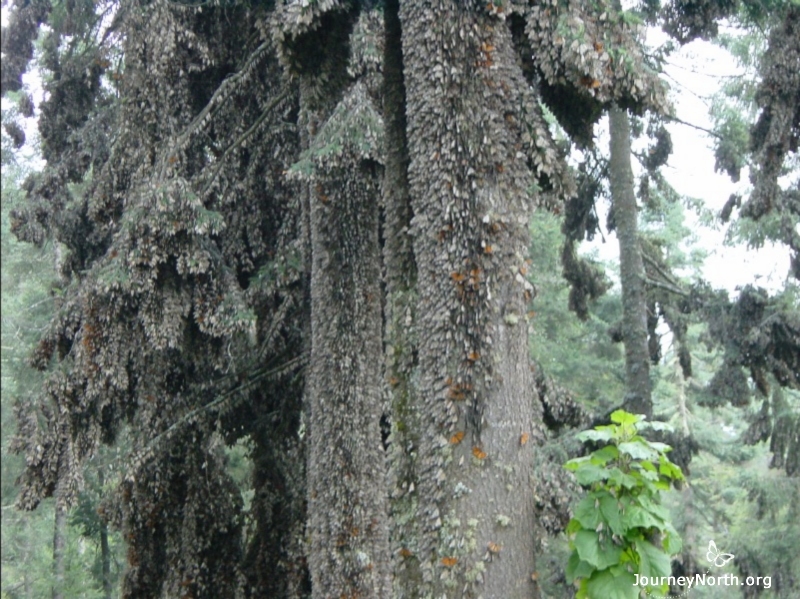 However, if the butterflies are also WET, it will kill close to 80-90% of the monarchs." Warm Temperatures are Dangerous Too If temperatures are too warm during the winter, the butterflies will burn their stored fat too quickly. Like running out of gas, they won't have enough to survive the winter and migrate north in the spring. Monarchs store lipids in their abdomen. With practice, a person can tell the condition of a monarch. 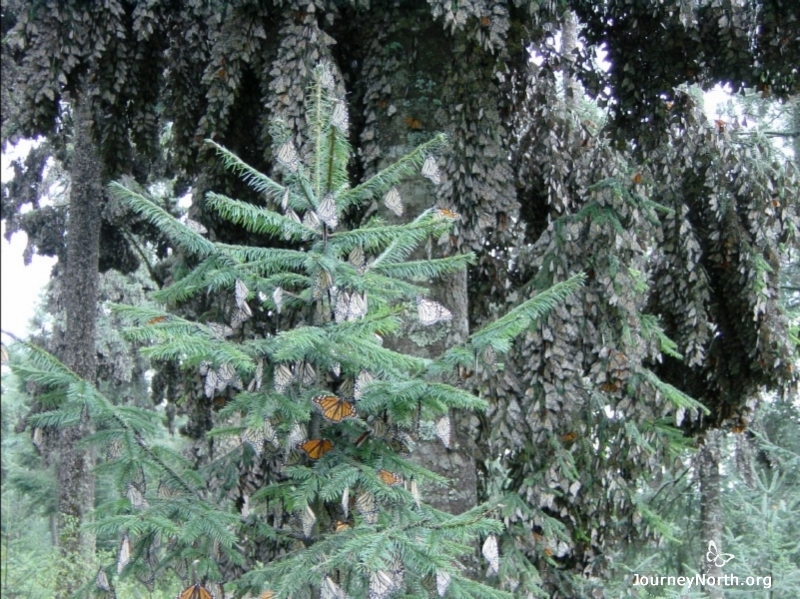 The Forest Protects the Monarchs Outside of the forest, temperatures can rise and fall sharply between day and night. Inside the forest, temperatures don't change as much. Dr. Lincoln Brower says the forest acts like a blanket and an umbrella. It protects the monarchs from cold and moisture. If the forest is cut or thinned monarchs will not have the protection they need. Visiting a Colony on a Cool Day On a cool day you can see many ways cold temperatures affect monarch butterflies. 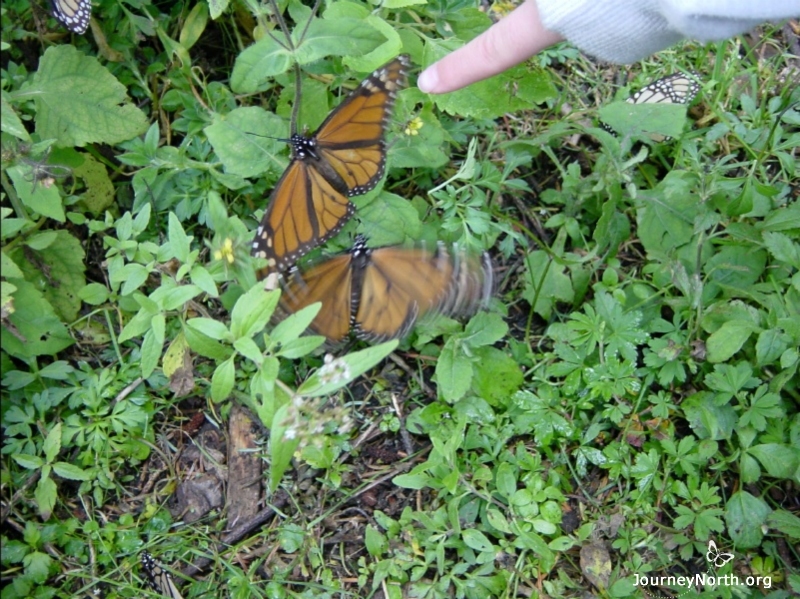 For example, cold monarchs are clumsy when they try to fly. They often fall out of the air and land in funny places. This cold monarch landed on a mustache! Crawling to Safety After a Storm On a cool day you often see monarchs on the ground. Strong winds and heavy rain can blow them down from their clusters. 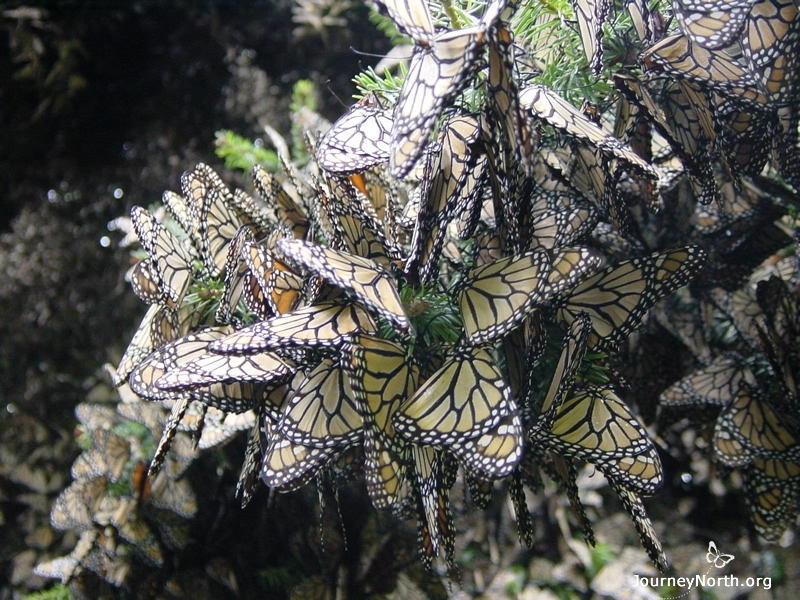 If the monarchs are cold, it may take hours — or even days — for them to return to the safety of the cluster. 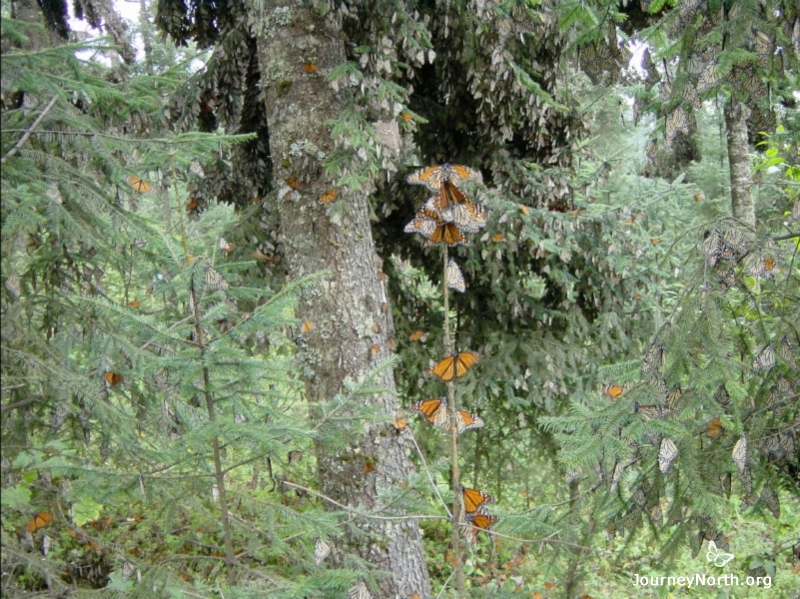 Slowly but surely, the monarchs pictured here are climbing back to the trees after being blown down by a storm. Surviving a Snowstorm It even snows occasionally in the colonies in Mexico. 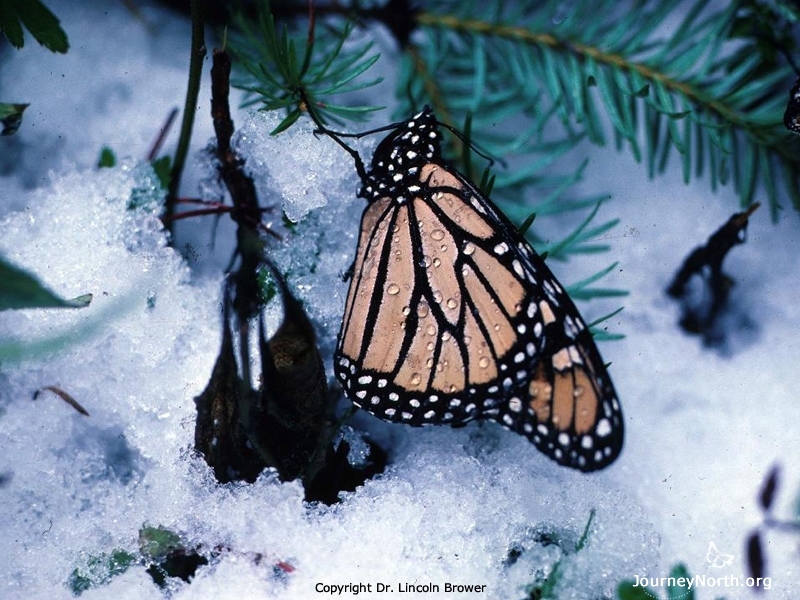 "If buried by snow, monarchs might stay on the ground under the snow for more than a week!" says Dr. Bill Calvert. Amazingly, many can survive a snowstorm if they can stay dry. Shivering to Warm Muscles On a cool day in a colony the forest floor is alive with shivering monarchs. The butterflies move their wings so quickly they’re blurry. You can hear the wings fluttering against nearby vegetation. Monarchs shiver to warm their muscles. After shivering, they can crawl and fly at temperatures that would otherwise be too cold. Avoiding the Forest Floor On a cool day in a colony, you will always see butterflies climbing. They climb to the top of sticks, twigs, and tiny trees like the one pictured here. 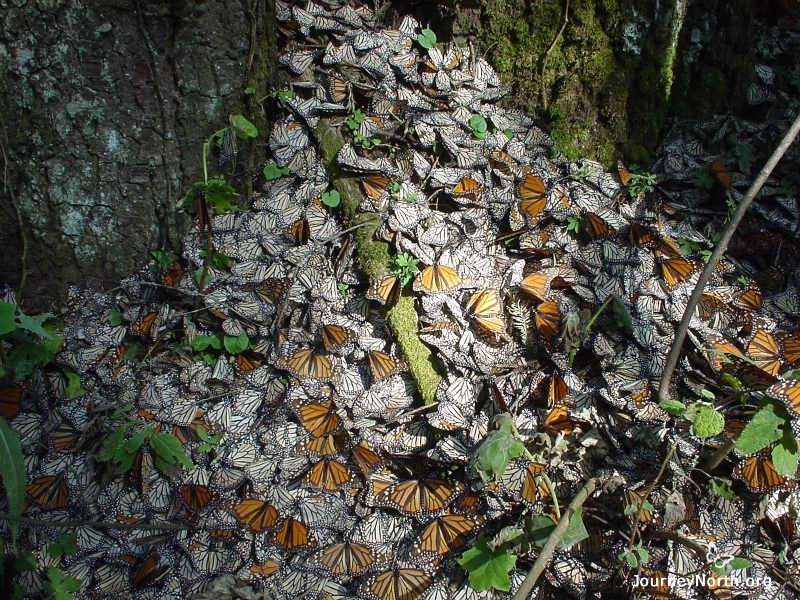 Monarchs struggle hard to get off the ground because the forest floor is dangerous. On the ground, they are exposed to predators, dew, colder temperatures and even frost and snow. A Delicate Balance Monarchs need cool temperatures to survive, but cool temperatures also present dangers. Shivering, crawling, climbing and flying to safety are adaptive behaviors. 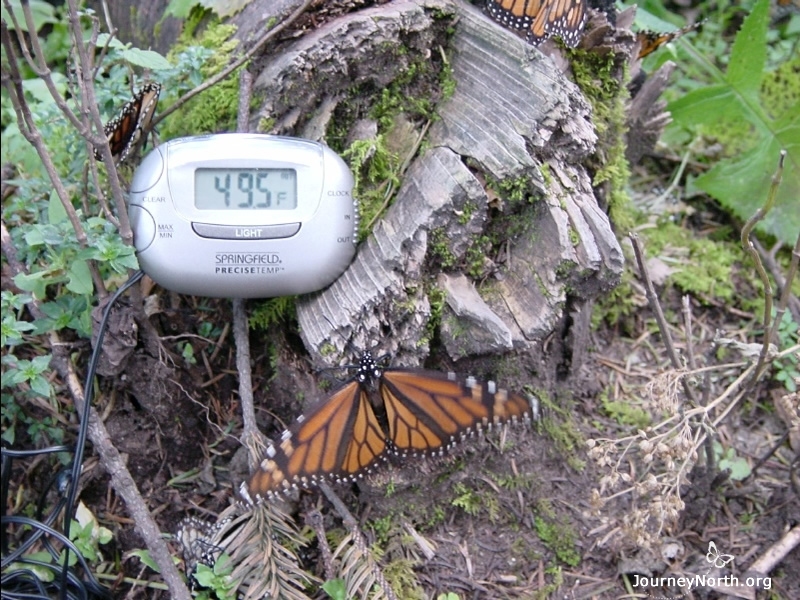 The forest microclimate provides the critical temperature balance the monarchs need to survive. What temperatures do overwintering monarchs need to survive?